How long did it take you, Arkangel? Thanks! I found out about the contest 2 weeks after it had already started so didn't have time for a real background. I'd say easily 55+ hours. I worked on it everyday after work for at least 4 hours for the remainder of the duration of the contest (longer on weekends). I haven't worked on any art (drawing/digital painting) in 5-10 years and used this as a challenge to see if I still could after not touching anything for so long. Oh wow, more than 55 hours! The shading and highlights alone must have taken a big section of that time. I think you more than rose to the challenge! It's obvious you have a real talent there … it looks like a professional illustration. The pose is great and gives real personality to your Ark Hunter. All the attention to detail like the Castithan headpiece and recurrence of the Defiant Few logo / motif … it's marvellous! I considered entering the competition, but when I saw some of the entries, like yours, I thought there was no chance of beating them. I would have only really done it for the fun of it, to enjoy the process and also to perhaps achieve something which you have done so admirably: produced a picture that is worthy of framing (and hanging on the wall), as a long term memento of your character and the game itself. Thanks Lux Energon, I appreciate the words of encouragement. Ha! I am far from a professional artist or illustrator, it's just a passion I haven't pursued in a long time. I enjoyed seeing what others created and think you should have entered your art, you would have had just as much chance to win as anyone else. Thank you Tyrant! I don't know about rigged, but I agree with you on most of your points. The results were a bit dissapointing, given how much time and effort I put into this piece. 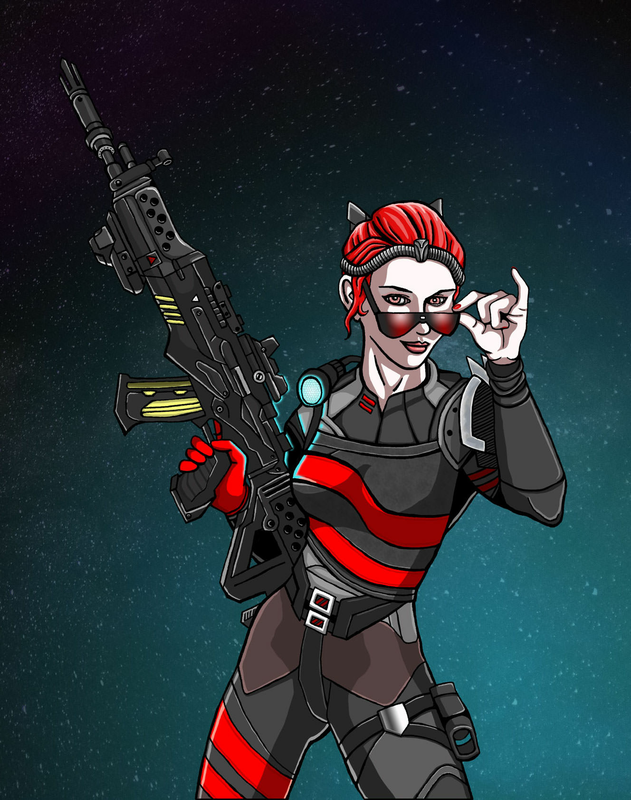 Arkangel Lilith enjoying a short respite from Arkfalls while remaining fashionable in her Defiant Few Recon Gear and Renegade shades.